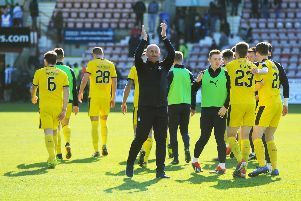 Falkirk manager Peter Houston had ‘stern words’ for his players at half-time on Saturday. The discussion seemed to do the trick as Falkirk grabbed a point at Cappuielow from Morton – one which seemed unlikely at half-time after a poor opening from the Bairns. Indeed Luke Leahy’s goal which levelled matters in injury time was barely foreseen by the Bairns manager who feared falling further behind after the break. But the second half improvement pleased the boss, who still smouldered over the Bairns’ first 45 minutes. “It was night and day. The difference between the first and second half was purely our attitude,” Houston said. He added: “Our attitude in the first half was poor. The attitude in the second half after we’d had a chat with them at half-time was superb. “You can’t expect a switch to go on and off. You have to go with that attitude from the first half, and go with the attitude from thesecond half where we dominated the game, after being dominated, totally, in the first half by Morton. “We have to be at it from the first minute. I’m delighted we showed spirit and they got something in the end but we shouldn’t be in a position where we have to have stern words at half-time where they worked harder than us. “It’s down to attitude and if it’s not spot-on, this will be a very difficult place to come. Here, it’s taken a long throw and a scrappy goal to give us the point that our second half performance deserved. But at half-time I thought it could go 2-0 rather than 1-1. I cant be happy with it, I’m pleased with their second half attitude but not their first half and I’m disappointed and it’s something we will discuss.